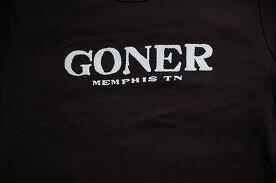 Home :: Goner Label :: Memphis T-shirt size L - Free US Shipping! Memphis T-shirt size L - Free US Shipping! Very cool Memphis t-shirt... Orange on dark blue shirt... support your favorite disfunctional city with the best music & best peoples! Free U.S. Shipping! These will be shipped First Class (included in the price.) They can't go Media Mail, which is reserved for books, records, tapes, cds, dvds, and cassettes. NON-UNITED STATES CUSTOMERS- Shipping charges apply, check out as usual! THANKS!